Bayan Salman: Novelist, writer and poet. 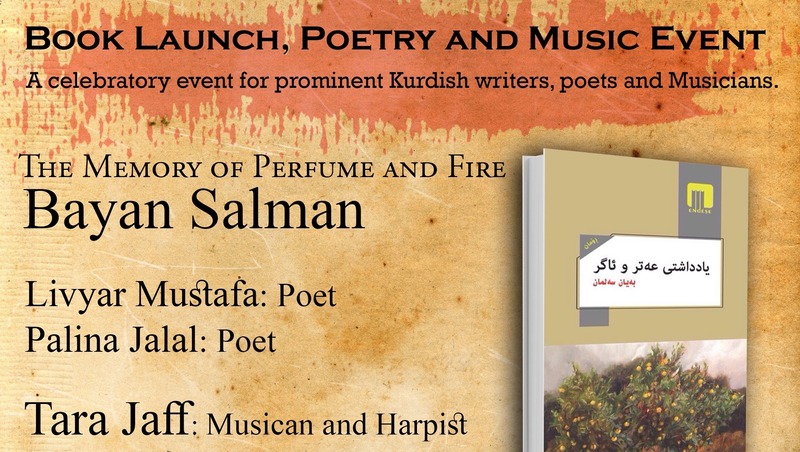 Will be launching her new novel The Memory of Perfume and Fire. Tara Jaff:Aprominent Kurdish Iraqi Musician. Will be playing the harp. Livyar Mustafa:Will be reading from her poems, mainly on the conceptualising issues of juggling a dual identity whilst being raised in the diaspora. Palina Jalal: Will be reading from her new poems about the struggles of residing as a Kurdish female within the Kurdish diaspora community. Nearest Tube Station: Holborn on Piccadilly and Central lines. Bayan Salman: was born in South Kurdistan but lives and works in Paris. She is also a journalist, academic feminist and author of several novels, poetry collections and translations. She has written in Kurdish, Arabic and French. Born in 1961, in Kirkuk city and graduated from Baghdad University with a degree in political economy. In France she studied at Paris VIII University of France, completing a degree in modern literature and a master’s in French and modern literature in 2006. Tara Jaff: is a Kurdish musician who has been exposed to many influences.Over the years she experimented with different string instruments, but it was her fascination with the ancient harps of Sumeria and Mesopotamia, dating as far back as 3000BC, that led her to the contemporary Celtic harp. Tara has embraced this instrument and has introduced it to Kurdish music, and in particular to folk songs in the Hawrami dialect. She has developed an innovative style to adapt to the various musical rhythms and modes of the region, bringing a contemporary expression to an ancient form of song and music. Livyar Mustafa: holds a BSc degree in Biomedical Science from St Georges University London, and is currently studying graduate entry medicine. She specialised in global health as part of her final year studies, focussing on violence against women and honour-based violence in Iraq, prior during and post conflict, in which she aims to develop during her academic studies. Her spoken word poetry conceptualises her issues of juggling a dual identity whilst being raised in the diaspora.